[0:34] <uriah> so, it's too bad that since 10000 raspberry pi's are being made, most people will only receive them about 2 months after they're released. [0:35] <uriah> btw... who here is going to be using gentoo on theirs? [1:04] <azalyn> uriah: i might use gentoo. [1:04] <azalyn> i don't know yet. [1:04] <azalyn> i'm using gentoo on my desktop. [1:04] <azalyn> if i use gentoo on the pi though, i'd probably want to use distcc to compile..
[1:05] <uriah> azalyn: uhm, wouldn't you rather cross-compile and then copy it to the sd card? [1:06] <azalyn> maybe? i've never done that before. [1:06] <azalyn> so i'm not so sure how to go about it. [1:06] <azalyn> i've only used gentoo on amd64. [1:07] <uriah> who here has an alpha board? [1:07] <azalyn> but that was a long time ago. [1:07] <uriah> ChrisLenz: do you also have a quasi-production board? [1:08] <azalyn> i've never installed linux on any arm device. the only arm device i even own is my palm pre. [1:08] <azalyn> which has linux/webos on it by default. but i haven't messed with it. [1:08] <uriah> oh, good then. [1:09] <azalyn> i'm in no rush. [1:09] <azalyn> i think it's a shame they won't have mounting holes though. but i understand why. [1:10] <RaspberryAlison> Remind me again why I have Raspberry on hilight. [1:11] <azalyn> people with 3d printers don't just grow in my backyard, you know? [1:12] <azalyn> it's not really a case that i want. i just want to be able to mount it somewhere. [1:12] <azalyn> maybe on a desk..
[1:12] <azalyn> even without a case. [1:12] <azalyn> i'll probably magic something up. [1:15] <azalyn> everytime i use it, the cutting wheels get used up within less than a minute..
[1:17] <azalyn> i can use the dnc vias, since they're not used for anything else. [1:17] <azalyn> would have to be something plastic or whatever that doesn't conduct. [1:21] <azalyn> oh my, that's so cute, i just rewatched the video (red wire one) and noticed that they replaced tux with a raspberry! [1:22] <uriah> what 'distro' were they using? [1:22] <azalyn> i have no idea. but i'm going to guess debian. [1:22] <azalyn> since it's slow. [1:22] <azalyn> it's too new. [1:23] <azalyn> i might do an lfs one day, but just to learn from it. [1:23] <azalyn> i never want to run lfs on anything important. [1:24] <azalyn> arch would be ideal if the arm arch port works well. [1:27] <piofcube> I need to get my head round this TI PIC coding environment. Just finished recording a video showing how to set up the dev board... Now I need to write some code to make it do something. [2:21] <uriah> piofcube: the problem is, though... do you think the magnetometer on there will work through a hard drive casing? [2:24] <uriah> will a magnetic field be sensed through a hard drive casing if i take all of the hd's components out and place my electronics in it to shield them from cosmic radiation? [2:27] <piofcube> True and I guess you could even mount it where the IDE/SATA sockets would have been. Maybe mount the board where the HDD controler used to be. [2:48] <ReggieUK> uriah, AWESOME and KUDOS!!!! [2:48] <ReggieUK> what will your electronics be doing? [2:49] <PiBot> IT_Sean| Crap! Hide the pretzels!!! [2:50] <ReggieUK> let me guess your cousin figured the mirrors for kek? [2:52] <uriah> we have a freenode staffer in here? [2:53] <ReggieUK> is it on the utubez anywhere? [3:06] <ReggieUK> so I take it your electronics is for a comms satellite uriah? [3:16] <RITRedbeard> sign language? ASL? [3:17] <piofcube> The samurai video was on the R-Pi main page... I am just starting work on the sign-langauge system. [3:17] <RITRedbeard> I am interested. [3:17] <RITRedbeard> My university hosts NTID. [3:18] <RITRedbeard> Building 60, I think? [3:21] <RITRedbeard> Cool. Sounds pretty ambitious though! [3:21] <piofcube> Also, maybe work on a glove system of some kind for deaf/blind applications... I'm excited about that. [3:22] <piofcube> Yes, very ambitious but we hope to get a lot of people to contribute a little time. To begin with we will be using a talk table system then expand it to allow real-time conversion from text to sign (and possibly translations but even google has a tough time with that). [3:34] <uriah> these new headphones are pretty damned good. [3:34] <piofcube> I thought NASA would be after the R-Pi... they've started using Android phones up there as sats...so the R-pi would be more flexible. [3:35] <uriah> they use 1900mhz for comms? [3:35] <uriah> or do they use a phone with usb host? [3:35] <ReggieUK> they're using sms, or was that the russians on the grunt? [3:36] <Thorn_> have you been under cheyenne mountain? protip: there's no gate. [3:47] <RITRedbeard> I prevented an electrical fire due to my keen sense of smell and experience with accidentally having the soldering iron on plastics! [3:52] <Thorn_> and then it creates a wormhole in your mouth, you get sucked in and end up on a goua'ld mothership? [3:56] <uriah> does anyone here have experience with xbees? [3:57] <Thorn_> does that mean you can piss ink? [3:59] <uriah> have you used them before? [4:01] <kurt66> Newbie question here, Will I be able to take a Pi put linux on it and connect a hard drive and use it as a file server? [4:02] <uriah> how many mA can the 5V of the pi's usb port sustain? [4:03] <kurt66> anyone started making cases yet? [4:05] <Thorn_> sata is only 7 pins, can it be gpio wrapped? [4:06] <uriah> the pi's ethernet is 100mbit, right? [4:08] <uriah> Thorn_: i can control motors with gpio right? [4:09] <kurt66> so you would have to create your own drivers or something to what you connect to it? [4:12] <uriah> Thorn_: you can also read straight from there right? [4:18] <uriah> so what is uart? [4:18] <Thorn_> isnt uart for debugging the GPU orso? [4:23] <Thorn_> The Foundation will not include a GPIO driver in the initial release, standard linux GPIO drivers should work with minimal modification. The Foundation will not include a SPI driver in the initial release, we hope the community might write one. The Foundation will not include an I2C driver in the initial release, we hope the community might provide one, standard linux I2C drivers should work with minimal modification. [4:30] <Thorn_> who intends to buy one of the ten auctioned boards ? [4:33] <kurt66> is there a date for the auction yet? [4:33] <Thorn_> lose ? ?150 to win $5? [4:38] <kurt66> anyone know any good podcasts I need some new feeds!!! [4:39] <piofcube> SecurityNow via TWIT... I like Steve Gibson. [8:58] <mdavey> Thorn_: SPI stands for Serial Peripheral Bus. It is a 4-wire serial bus invented by Motorola for IC to IC communications. Its a little like USB and I2C. [9:02] <mdavey> Thorn_: UART stands for Universal Asynchronous Receiver/Transmitter. There is usually a transmit wire, a receive wire and a ground, often also a reverence voltage supply. UART is usually 3v3 or 5v TTL levels and can be thought of as the core building block for implementing a 12v RS232 interface. [9:05] <mdavey> Thorn_: 5v should not be fed into the R.Pi's 3v3 inputs including GPIO. Eben has stated that doing so will drastically reduce the lifetime of that circuitry. [9:09] <mdavey> Thorn_: There is no /proc interface for GPIO out of the box, but the team expect it will be relatively straightforward for the community to port drivers to R.Pi and get working. [16:02] <Dagger3> "And it?? ?s got that cute raspberry printed on it too!" [16:47] <PiBot> IT_Sean| That can be our motto! 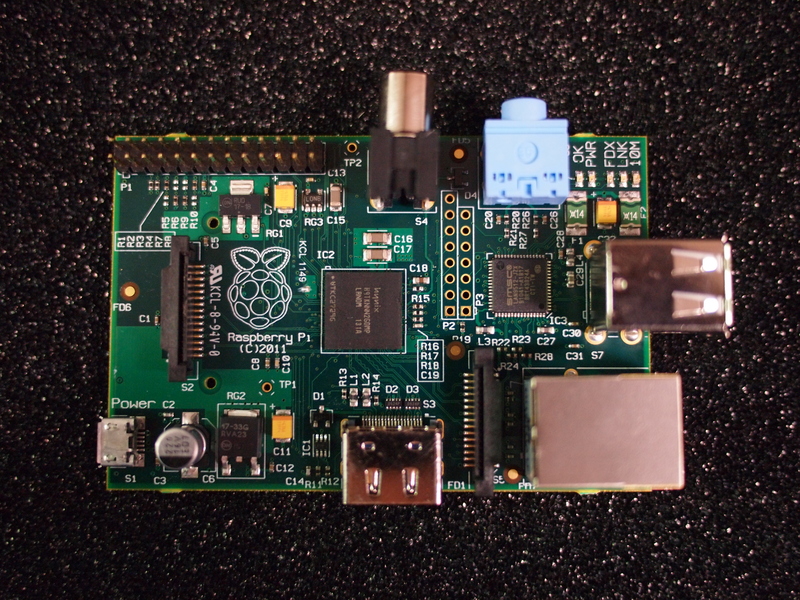 #raspberrypi, more fun than a spreadsheet! [17:20] <Thorn_> Does anyone know what the alien on the raspberrypi PCB photo is? [17:20] <IT_Sean> can you use the tux logo like that? [17:20] <ReggieUK> is there much chance of them changing the logo now? [17:20] <ReggieUK> as they ran a compo and all that to get the one they've got? [17:23] <wwalker> looks like some one scraped at it for a good ground contact, maybe for testing? [17:25] <wwalker> eek. I thought that was a joke for the logo. [17:26] <IT_Sean> us device manufacturers only wipe boogers on boards that are going to people we don't like, actually. [17:28] <IT_Sean> I would totally do that. [17:28] <ReggieUK> raspi II ultras !! [17:30] <IT_Sean> The Raspberrypi Model A. You can have it in any color you want, so long as you want black. [17:30] <IT_Sean> err... green, rather. [17:30] <IT_Sean> as long as you want green. [17:37] <IT_Sean> that's what i'm spending (some of) my christmas money on. A raspi B, and a new battery for my laptop. [17:47] <Maroni_> Ford Model T was the first affordable automobile, wikipedia says. [17:48] <traeak> A raspi B woah... what's that mean ? [17:50] <IT_Sean> I'm referring to the raspberrypi model B. The one with all the fruit. [17:50] <IT_Sean> i.e. the ethernet port & more memory. [17:54] <IT_Sean> you can get a cheap bluetooth dongle, no? [17:55] <traeak> i guess a game controller isn' too expensive? [17:56] <IT_Sean> USB based RF stuff can be cheaper, if you shop around. [17:56] <traeak> can i find usb rf taht supports keyboard, mouse and game controller together? [18:32] <PiBot> IT_Sean| <IT_Sean> That can be our motto! "#rasberrypi. More fun than a spreadsheet!" [18:40] <futurity> Hi, is there an estimated date for when we can start ordering a board? I noticed the problem with the beta board, so I take it there is a delay on the final boards being manufactured? [18:41] <IT_Sean> have you read the latest blog posts? [18:41] <futurity> UnderSampled: great news. i take it no ETA on when orders can be placed? [18:44] <IT_Sean> UnderSampled: Why would you think i have anything to do with the topic? [18:45] <IT_Sean> what reason is that? [18:45] <UnderSampled> IT_Sean: I guess i'll have to wait for ukscone? [18:48] <IT_Sean> At least, not officially. [18:49] <IT_Sean> if there is someone here from The Org, they do not make it well known. [19:10] <IT_Sean> it DOES say "unofficial"
[19:16] <ukscone> Dagger3: not all irc clients bother with bold, italics etc. [19:20] <AndroUser> What is muc? [19:21] <IT_Sean> I rather like IRC. [19:24] <IT_Sean> I belong to several active IRC channels, and i have IRC clients for all of my devices, including my iPad (which i am on right now, in fact). [19:52] <IT_Sean> 39 to go, out of ~320 total. [19:54] <futurity> IT_Sean: you flashing Raspberry Pi boards, or other variations of single chip computers? [19:58] <Cheery> quick question. when can I buy one? [20:28] <IT_Sean> i wouldn't call it stupidly overpriced. [20:28] <IT_Sean> It is expensive, but... not stupidly so. [20:34] <azalyn> all of that 'enterprise' crap is expensive. and strangely enough, the large corporations won't buy it if it *isnt* overpriced. [20:34] <azalyn> you could have a better product, and they'll assume it's crap if it's less expensive. [20:35] <azalyn> that's just how business seems to work. [22:51] <nsaquatics> afternoon!... Is there a linux install like what will be on the PI that we can install in a virtual machine so I can test if it's compatible with the phigets drivers? [23:58] <paulmcmn> nsaquatics: good question - can anyonehelp?